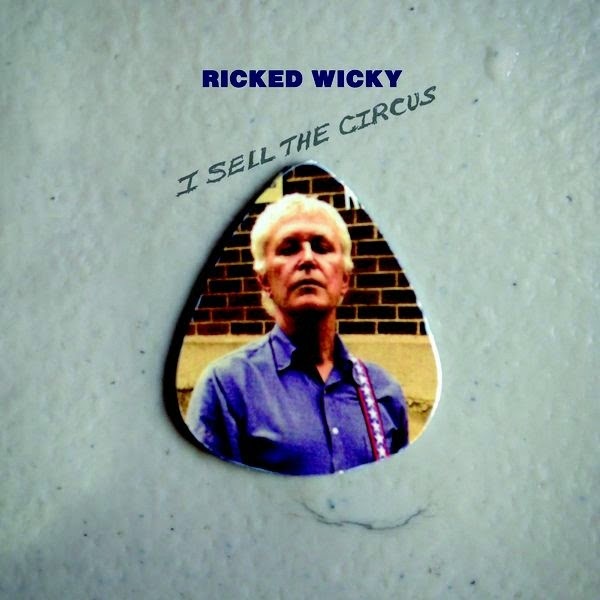 Following the dissolution of the reunited Guided by Voices in late 2014, Pollard wasted no time announcing his next project, Ricked Wicky. The new band quickly hit the press as Pollard tried to publicly sort out the end of the beloved Guided by Voices, ultimately revealing scant details about the actual end of the band. With the new blood injected into Ricked Wicky, self identifying themselves as a supergroup, the listener is graced by the presence of some highly familiar members of the Pollard universe. Long-time recording engineer/current Circus Devils partner Todd Tobias handles bass duties. Trusted GBV workhorse Kevin March sits behind the kit. New to the mix, and highly touted by Pollard, is Nick Mitchell (no relation to ex-GBV guitarist, Mitch Mitchell). A staple of the Dayton bar rock scene, Pollard takes Mitchell under his wing, unleashing a new batch of mini-arena rockers into the world with the new quartet. A lot of hype went into Ricked Wicky, compared to some of the recent non-GBV Pollard releases. In the press, Pollard proclaimed the album was a return to the prog-pop of the late GBV period of the mid-'00s, In addition, the name Ricked Wicky is supposedly Pollard's imaginary band from his teenage years, adding to the endless lore of all that is the Fading Captain. With all the burgeoning hoopla, the record is a fairly solid collection of arena rockers, as promised. In the end, the album never really gets the backbone of voluminous crunch it needs, and few tricks are up Pollard's sleeve on this one. However, one can only hope this is the new vehicle for some time to come as it continues to push the vehicle forward in the right direction. Well Suited- 4 As described prior to the release, this opener contains plenty of starts and stops, stomps and abrupt shifts circa late period Guided by Voices. Angular throughout, various sections seamlessly pieced together, the song ends on a strong pop note. Solid, but just misses being a classic. Death Metal Kid- 4 A slow builder AND a slow grower. Definitely gets better with repeated listens. Sluggish, minimal guitar chug. Bare bones vocal hook that works. Hazy, slower bridge breaks in as the song eventually builds to an end. Can't help but wish Pollard went for it a little more, vocally. Guts- 3 Drums stomp, propelling this one forward, but the guitars just sort meander the whole way. A real hooky track that never quite bursts out of its confines. Feels like any moment this one will take off but never does. Still, it remains a pretty streamlined, tightly packaged rocker throughout. Cow Headed Moon- 4 The semi-bizarre ballad of side A. Organ pumps mellowly in the background as woozy strings carry this along. This one's another track that gets better with age. Upon the first few listens, you might miss how arresting this jumbled mash can be. Piss Face- 5 Heavy, plodding stomper. Another simple, yet killer vocal hook that recalls some past Pollard all-star moments. The repetitive guitar accents are nothing groundbreaking, but a welcome addition to the library. Great Nick Mitchell guitar solo. The new classic. Even Today and Tomorrow- 2 One of those so-cold-you-can-see-your-breath tracks. Prickly, classical guitar style picking as the band plays along in a wayward fog. Distant and gloomy throughout, with some hope poking through at the end. Still, nothing special. A real downer, not in a good way. The Intellectual Types- 2 Pollard penned/Nick Mitchell sung closer to Side A. Mitchell comes off as part '80s hardrock, part younger Robert Pollard. The vocal similarities are eerie at times to the Fading Captain. The song's a start-stop rock tune complete with a pretty half-assed melody. Don't dig Nick Mitchell's vocals on this. A dated sounding snooze. Uranus Flies- 3 Okay, this song rules. But then again, it's called "Uranus Flies," complete with repeated vocal sections where Pollard declares.... well, "Uranus flies." Why? Knocks it down a notch for me. This sounds like any quality track off the past couple GBV reunion LPs, though. Meanders along at a building, melodic pace until the hooky, anthemic finish. The Important Girl- 2 Unnecessarily choppy. Pollard delivers a ho-hum vocal melody. All along, the song is all progged up, and never really feels like it comes together. One gets the feeling the band's awkwardly stepping on each other, trying to get to the end. Frenzy of Blame- 4 A rhythm guitar line so simple, it's almost idiotic. Still, this is incredibly infectious. The chorus is vintage Pollard too. This one really sticks in the brain. Perhaps far from brilliant, still solid. Mobility- 5 This single off the LP is a serious basher. Great dynamics leading to the kick in. The guitars crunch away, the bass rattles. It's tightly contained rebellion. Again, doesn't lay new ground but so familiar we can only revel in its glory. Pollard alternates between exceptionally authoritative speak singing, and tuneful bellowing. Definition of "cool." Tomorrow- 1 An instrumental version of the song "Even Today and Tomorrow" from side A. Was it a fan of it there, and still not so much here. A real momentum killer that, unnecessarily, breaks up a string of highlights. Rainy day, flamenco guitar stuff that puts me in a goddamn bad mood. Do we need to hear this? Miles of Concentration- 5 A serious-as-a-heart-attack rattling, jilted arena rocker. This one sounds big, Pollard owning it, vocally. The melody grows more infectious upon revisiting. Also, the short walk down thrown in the middle is excellent! Has a real "Alex and the Omegas" feel to it. Yes! Rotten Backboards- 3 Ricked Wicky dials things back here. A real sleepy, mopey track. This gains some upward traction towards the end, but never really breaks through though. Average at best. A Real Stab- 4 Pretty straight forward The Who arena rock track. Feels like it came straight from lost Earthquake Glue outtakes. The song crescendos, comes back to earth with some jangled interludes, and takes off again. They bash off into the night, Nick Mitchell sealing the deal with the closing solo. Into the future go Ricked Wicky. Love your site, fans can (and I'm sure have) spent months here. It must be a near full time job! Just one clarification--I didn't write "Tomorrow", it is literally the exact same song as the Pollard penned "Even Today and Tomorrow", just a different, instrumental version. We hadn't planned on doing an instrumental version of it, but when were were recording I asked Bob if we could quickly practice it without vocals so I could work out my guitar part, and Phil (owner/engineer of Cyberteknics) happened to record it. Bob loved it so much he included it as a "reprise" of the version with vocals. Lots of new Ricked Wicky coming soon, much of it a hell of a lot more weird and heavy than the first album. Bob has a plan. There is a method to what he's doing with this band and these albums. In Bob Ye Shall Trust! Cheers and keep up the fine work. Thank you so much for the good words on the site and contributing some info on the upcoming Ricked Wicky stuff. Really excited to see what you guys have coming up. Also, thank you for the clarification on the song "Tomorrow." I could have sworn somewhere in the liner notes it was listed as your song either on the lyrics sheet or the record label itself. Going back, I see that there's no such listing there. Relistening to the two back to back, I see they're the same song. Sorry for the mix up, and I'm going to edit it. Thanks again Nick. Can't wait for the next release! Take care. Maybe it's because I took in a lot of 80's hair metal back then, but Intellectual Types is one of my favorites!! In fact, it's one of the peaks of the Wicked catalog for me, maybe if only for the interesting contrast to Pollard's stuff. But the lyrics are really cool..
Good work on this site. I just found it and I'm having fun reading through it!